I mentioned yesterday that I got to watch my sister's 3 youngest kiddos for a couple of hours and I just wanted to report that I survived. Not only did I manage to get them back to their mom without any marks, I also had a blast! Ashley brought me one of my favorite things. An iced vanilla latte from Rocket Brothers. A ginormous one. I drank it up after I caught Fire Cracker trying to steal a taste from my straw. Sweet P also tried getting a taste. Good thing I'm still faster than her. Needless to say, Sweet P was quite entertained with her cousins. 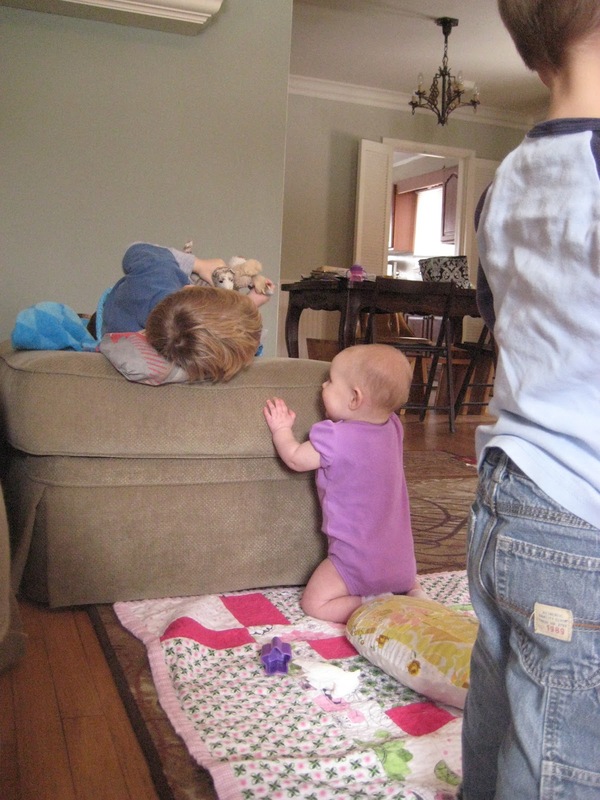 She was especially interested in Little Brother Cousin's hair. So interested that she pulled up on her knees for the first time to get a handful. He was great about it. He laughed and then asked me if I could get her. The boys were amazing. They played with Sweet P's toys and gave her lots of love. Duncan had a cuddle buddy. I tried the other dvd players and their other movies but not a single one would play. Little Brother Cousin told me I should "blow on it". This made me laugh as I thought about the original Nintendo system and how everyone I knew blew on those things. I'm pretty sure that's were that whole blow-on-it started. Anyway, blowing on it didn't work so we put one of my movies in. When Fire Cracker woke up from her nap Sweet P was down for her's and the first word out of her mouth was "baby?" I told her baby was sleeping and handed her the monitor so she could see her Sister Cousin. She carried it around the house for a while until she saw a framed picture of her. She loves her Sister Cousin! And the poo-poo cookies I mentioned yesterday. Well, Little Brother Cousin asked what they were and after telling him, he told me he didn't want Duncan's poop. Duncan is my little dog. I told him that's what his Nana called them when his mom and I were growing up and explained what they were made of. He tasted one and told me he didn't like it. Guess my cooking isn't for everyone!! Thank you, Ashley, for letting me spend the afternoon with your kids. It was a treat and they're welcome anytime. Aww how fun! I loved it as a kid when my cousins came over to play! Heck, I love it now when my cousins come over to play!